Groundfloor: from the livingroom (TV, dvd, stereo, ) , with corner fireplace and large window doors to the terrace an archway opens into the fully eqipped kitchen (4flame gas stove, oven, dishwasher, fridge/freezew combination, toaster, American & Italian coffee maker etc. etc. ) with additional dining space. also here a direct access to the terrace, that stretches along the complete housefront. Straight on the spacious bedroom no. 1 (2 singles, 1 sofa bed for children or teens only, extra charge) with ensuite bathroom. The lovely cottage 'Casa Capannina', a small semiattached quarrystone villa, is set slightly aside with its back to the other 3 buildings of Poderi Val Verde, which guarantees much privacy. It was constructed with quarystones by the farmers when clearing woodlands and macchia slopes to prepare land for vineyards and olivegroves .Stones that traditionally were use for building houses or terrassed-walls. Its original use was as stable for cows . Prove of this gives the typical long house structure, its low ceilings and separate position. This cottage, completely restored in 2009, when we also added additional living space (the 'tower') is the perfect location for honeymooners, 2 couples or a small family looking for privacy and peace - and is the perfect starting point for sightseeing since most important sights can be easily reached within an hours drive. Especially here is the 'rule' - enjoy the sunset in complete silence from your terrace with its shady pavillon, garden furniture, sunbeds as well as a bbq. Gaze onto onto the extended gardens, the romantic creek and the surrounding maddows and vast macchia covered hills of this private property of more then 76 ha. Start your hiking and biking directly form your doorsteps on well marked trails. Or simply take a stroll on our meditation trail along the small creek with its waterfalls, walk up to the waterlily pond or through the valley to the nearby town of Castellina in Chianti . Animated is this small paradise by various cats, 2 freeroaming wellbehaved dogs (1 male, 1 lively female), a pictoresque small herd of cameroon sheep, chicken, geese, ducks, pigeons and more. Stunning the variaty of birds and butterflies as well as fireflies. And with a bit of patience one may also see wild boars, deer and roe deer, foxes, badgers and porcupines as well as the rare Tuscan eagle that breeds in our valley. When planing your trip take in consideration that due to our perfect location, most important sights can be easily reached within 1 hours drive. Also please dont forget to leave some space for one of the many concerts, horseback riding or some evening with newfound friends or maybe a halfday cookery course with local dishes. Extremes like biking on the new trail up at the Apennin mountains or island hoping on the Tuscan coast are also possible. The 16th century privately owned Val Verde - a 76 ha large property, is situated inmidst the natural resort area of the 'Oasis del Chianti'- which guarantees absolute privacy and peace. Its various farmhouse accommodations are situated only 2 kilometres from the famous wine town Castellina in Chianti with shopping facilities and restaurants. Other famous towns and cities such as Florence, Siena, Greve, Radda, Gaiole, as well as San Gimignano, Lucca, Pistoia, Arezzo are very close, some less then 1 hour by car. If you drive a bit more, you will find Cortona, Perugia or Pisa; even day trips by train or car to Rome, Milano or Venice are possible. In this small family style hamlet our sophisticated guests will find undisturbed and unspoiled nature, silence, sun, good food (cookery courses) and fantastic wines. The German owner Ulrike with her son Fabian both English speaking outgoing and openminded people that will gladly be of assistance and share their experiences with their many international guests. fully equipped kitchen with stove, oven etc. etc. 5,5x11m - 1,20-1,60m, very large leisure area with garden furniture - few guests - no crowds! An excellent for visiting Tuscany in the Fall! We found this property to be an excellent location for taking day trips to nearby hill top cities. It is located only about 1 mile from Castellina in Chianti, where there are excellent restaurants, grocery and wine shops. We had a perfect week in Chianti with cool temperatures, fewer tourists, and no rain. The temperatures were such that we did not utilize their in ground pool. I would recommend purchasing their breakfast services. It is a great time to meet other guests and discuss where others have gone the previous day for sightseeing, etc. Ulrike (a German) maintains a very tidy facility and unlike some facilities in Italy, everything works well! We also enjoyed Ulrike's culinary expertise. She is an excellent chef! We stayed in this cottage week commencing 9th June 2008 and can highly recommend , it was kept lovely and in a fantastic location and the host Ulrika, was fantastic and her cooking is worth coming back for alone. We will be returning. I have been staying at this agritourismo for 7 years. It is such a wonderful setting, in one of the most beautiful regions of Italy. Ulrike who owns the place has put her heart and soul into these apts. This particular apt is so lovely and isolated from the other apts. We viewed deer and wild boar on the hillside opposite while enjoying a grilled dinner and wine on the terrace. 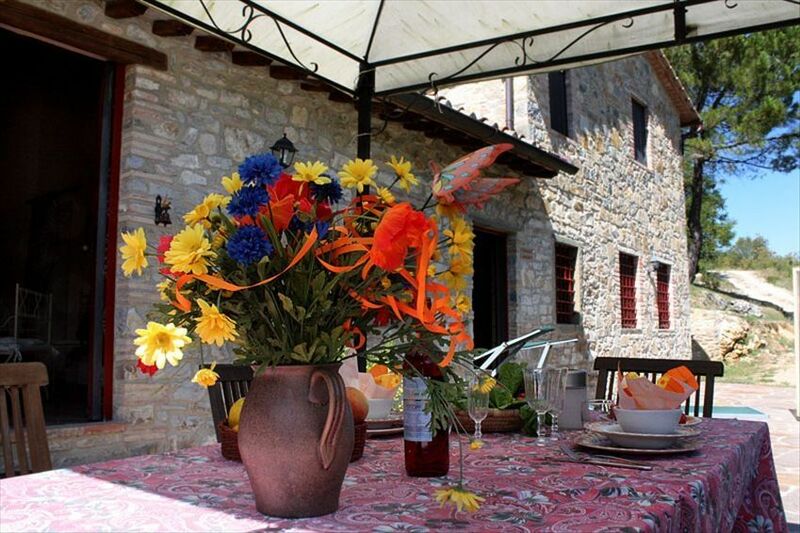 Ulrike offers some wonderful cooking courses--real country tuscan dishes. I always sign up for the welcome dinner on Sat night--it is so good and so fun to meet the other guests. These dinners are festive and always international--she has guests from all over the world. I highly recommend these apts--always so clean and in a wonderful setting.